those who perform the mandatory prayer and give to the mandatory charity and they are certain of the hereafter. They are on guidance from their Master, and they are the successful ones. And some of the people buy (and accept) the amusing (and baseless) saying in order to misguide (people) from God's way without knowledge, and they take it as a joke. They have a humiliating punishment. And when Our verses are read to him, he turns away arrogantly as if he did not hear it or as if his ears are hard of hearing, so give him the news a painful punishment. remaining in them forever. God’s promise is true, and He is the powerful and the knowledgeable. He created the skies without any pillars that you see it, and He placed firm mountains in the earth so that it does not shake you (as violently), and He scattered all kinds of creatures in it. And We sent down rain from the sky, then We grew all types of splendid plants in it. This is God’s creation, so show me what did those besides Him created. No, but he wrongdoers are in an obvious error. And We have certainly given Luqman the wisdom (saying): be thankful to God, And whoever is grateful, then he is only grateful for himself, and whoever is ungrateful then indeed God is needless and praiseworthy. And (remember) when Luqman said to his son while advising him: my son, do not associate (any partner) with God, for associating (partners with God) is certainly a great wrongdoing. And We instructed the human being about his parents, his mother carried him (getting) weaker and weaker, and his weaning (off breastfeeding) is in two years. You should be thankful to Me and your parents. The final return is to Me. And if they try to make you associate (partners) with Me that which you have no knowledge of, then do not obey them, but continue to be nice to them in this world, and follow the way of everyone who returned to Me (in repentance), then your return is to Me, and I inform you of what you were doing. My son, indeed if it (your action) is the weight of a mustard seed and it is in a rock or in the skies or on the earth, God brings it (into account). Indeed God is nice and well informed. My son, perform the mandatory prayer and instruct to the right (and acceptable) and prohibit from the wrong (and unacceptable) and be patient about what happens to you, indeed that is the matters of great determination . And do not turn your cheek away from the people, and do not walk on the earth arrogantly, for God does not like every selfish show offs. And be modest in your walking and lower your voice, for the most awful voice is certainly voice of the donkey. Did you not see that God brought whatever in the skies and whatever on the earth under your control (and at your service), and He abundantly gave you His favor, apparent and hidden? 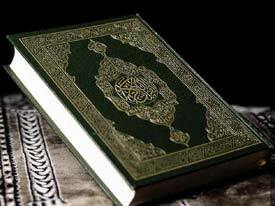 And some of the people argue about God without any knowledge and without any guidance and without an enlightening book. And anyone who submits his manner (of life) to God and he is a good doer then he has indeed grabbed on to the firm handle, and the end of the affairs is with God. And anyone who disbelieves, then do not let his disbelief make you sad. Their return is to Us, and We inform them of what they did. Indeed God knows well what is inside the chests (minds). We let them enjoy for a little, then We force them to a severe punishment. And if you ask them who created the skies and the earth? They shall say: God. Say: all praise belongs to God. No, but most of them do not know. Whatever in the skies and the earth belongs to God. Indeed God is the rich (and needless) and the praiseworthy. If whatever tree on the earth is (made into) pens, and the sea fill it up (with ink) and seven more seas (replenish it) after that, God’s words would not finish. Indeed God is powerful and knowledgeable. Your creation and your resurrection is only like (creation of) a single person. Indeed God hears all and sees all. Did you not see that God makes the night pass through the day and makes the day pass through the night, and He controlled the sun and the moon, each running (its course) in a finite time, and God is well informed of what you do? That is because God is the truth, and that whatever they call on other than Him is the falsehood, and that God is the superior, the great. Or did you not see that the ship sails in the sea by God’s favor, so that He shows you some of His signs? For there are certainly signs in that for every patient and thankful (person). And when a wave covers them like the shades, they call on God being sincere to Him in the religion, then when He saves them to the land, some of them keep to the middle course, and no one rejects Our signs except every ungrateful traitor. People, be cautious of your Master and fear a day when no father repays for his child and no child can repay anything for his father. Indeed God’s promise is true, so do not be deceived by this world’s life, and do not be deceived by the deceiver (Satan) about God. Indeed knowledge of the hour is with God, and He sends down the rain and knows what is in the wombs, and no one knows what it will do tomorrow and no one knows in which land it will die. Indeed God is knowledgeable and well informed.